When it comes to decorating, bringing the outdoors in typically entails capturing a sense of nature within your home. There's always the literal translation, utilizing plants, decor, and wallcoverings that mimic the outdoors. Another way to share this feeling is with large windows that frame the natural world outside as if they were framed pieces of art on your wall. However, here in metro Detroit, we have a completely unique set of expectations of our outdoor spaces and how we utilize them in our homes. If you're like us, you have an appreciation for urban decay. The surface finishes, patinas, and textures of rusting metal, flaking paint and brick are interesting to us. Granted, the time has passed when finding beauty in the apparently ugly was groundbreaking; indeed, the notion has in some situations moved well beyond subversive to simply cliche. Regardless, we still are seeking out new and exciting custom wallpaper projects that capture the essence of bringing the outdoors in, be it purely natural or capturing the sense of urban decay. Along those lines, we just can't turn a blind eye to an image such as the one shown above. 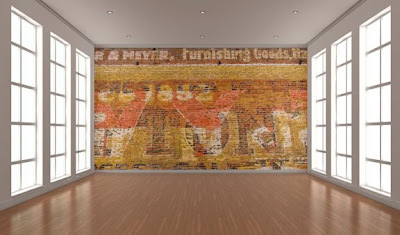 The wall mural is an image of an aged advertisement painted on a brick building's exterior. This custom wallpaper project pulls together the feeling of being outdoors while also capitalizing on the sensibility of urban decay. Fresh white walls and windows that allow light to spill in on the craggy brick and flaking paint of the mural is our idea of perfectly planned juxtaposition. The yellow ochre and rust tones of the wallpaper mural play perfectly with the finish of the wood floors as well. Interested in trying this look out in your home? Contact us to begin your custom wallpaper project today.